As someone who gets hired to offer training, insight and post production advice (albeit in a Premiere Pro context) I’m often presented with a variety of organisational post-production set-ups. From operations to the scale of the World Cup with billions of viewers across the globe, to single camera corporate/commercial scenarios and everything in between. One common theme that crops up regardless of the scale - is the need for diligent housekeeping & file/project management. Another aspect of what I do is I work as a self shooting freelancer. Which means I’m all too aware of how important effective project & file management is. Being freelance working face to face with clients, usually means you are responsible for the entire production; from planning to shooting, and from ingest to final delivery and then onto archive. Orchestra. Myself and other operators with which I regularly work have shot a number of concerts, events & interviews over the last few years. And we are gathering more content all the time. This means I am responsible for ensuring that once any given event has been filmed, I ingest & back up all of that content in as sensible and clear to understand method as possible. Another thing to consider (as anyone who has ever worked on their own productions will know) is that the volume of content increases rapidly - and so keeping on top of it is vitally important. A colleague of mine (Maxim Jago) once passed onto me a concept that I’ve never forgotten, and it’s something I try my best to stick to everyday. He calls it the two week rule, and the thinking behind it goes like this. If you’re working on a project daily - when you hit save on that project and walk away for the day, it’ll still be on your mind. You’ll go to bed that evening and the specifics of the project will still be saved in your short term memory banks. Once you reopen the project the following day - it will still be fresh, and you’ll be able to hit the ground running as you continue to work. Even if you have a weekend off (lucky you!) that project will be occupying your thoughts and come Monday morning once you open it up, all of the sequences, clips and bins will (hopefully) make perfect sense to you. But how about if on Friday evening - you click save, shut your machine down and then fly off to Mexico for 3 months. Upon your arrival back on a cold Monday morning - are you likely to remember what everything is inside and outside of that project? Where and what your clips are, how much progress you’ve made with your cuts and what the status of all your sequences are? Possibly not, as two weeks is the length of time that (generally speaking) it takes any project to completely leave your short term memory, and so after 3 months in the Mexican sunshine it's highly unlikely you'll have been thinking much about that particular job, or anything even vaguely relating to it. This theory really struck a chord with me, and once I learned of the principal, everything I did in my work - every media card I ingest, every bin I created, every sequence I made etc, I made with the 2 week me in mind. I’d think ‘will the two week future me understand what this item/ bin/ sequence is?’ It’s made my life as an editor so so much easier and I work using this principle today. As an additional benefit once you begin to set things up and work with this principle of the ‘two week rule’ in mind, then not only will it make sense to you (in two weeks, two months, two years and beyond) but it will also very likely make sense to anyone you work with, who may need to pick up and inherit the project from you. It’s a principle which I have tried my absolute best to stick to, and it’s helped my work immeasurably. Just this week I spoke to a good friend of mine who works as a DIT. He’s been taken on for a 3 month project for the BBC, and they expect to gather over 100TB of media assets over that 3 month period. That’s typical, and it’s his job to make sure every card is offloaded and backed up. So keeping a strict track of what’s been ingested and where things are, is utterly vital. In terms of as to how extreme things can get, over the summer of 2018 I worked as Edit Suite Support manager for HBS at the World Cup in Moscow. The main storage volume we had there was 12 Petabytes. That’s a lot of hard drives. However - even given that extreme amount of content, because of how the material was ingested, stored, labelled and organised - all of the editors working for us had every single clip easily at their fingertips when they needed it. All of this goes to show that keeping your house in order is absolutely crucial for edits of any size. And so I thought it would be a nice way to start 2019 as we mean to go on - and I thought I might offer some tips that I’ve found useful over the years. When ingesting your material, consider the following things. - How much material will you need to store? - Do you want to rename your clips as you ingest them, or are you ok to work with native file names? - How many formats are you likely to be working with? - Will the volume of the material grow as the project progresses? - Will you be the sole editor or will you be working in collaboration with others? - Will you be able to backup all of your content in at least 2 other places? For my own personal workflows I have a template folder structure which I use religiously (see pic). At the beginning of every new project which I work on, I simply copy & paste the empty Master Folder into my desired storage volume, and then begin to populate the folders with the relevant assets once they’ve been acquired. I very rarely re-name the file names of my video assets, as I shoot mostly on my Sony FS7 which allows the renaming of clips in camera. - Delivery specifications ie. where will your delivered content end up. Multi-platform social media, broadcast, internal. All of these things impact on how you create your sequences once your media is imported into the project. - Clip resolutions & whether you want to work with the original recorded media, or whether you want to transcode to an DI (digital intermediate) format. Generally speaking its best practice to work with a DI, but this isn’t always practical and certainly not essential in most cases. 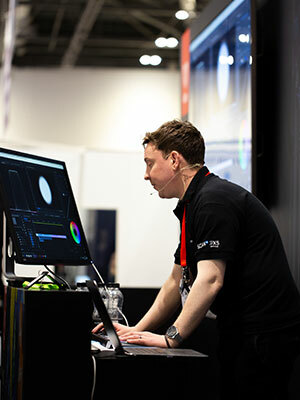 A proxy workflow is highly recommended if you are working with high resolutions such as UHD, 4K and beyond - as unless you have suitable resources regarding your editing system you will find playing back and working with your clips very difficult. Adobe Premiere Pro has a very simple to use proxy workflow, which I often employ. This allows you to work on material up to 8k on something as low-powered as a Macbook Air. It's a nice way to work! In the context of broadcast work, very often the process of creating and setting up a new project is looked after for you by the post production client you’re working for. For instance at the World Cup, HBS worked closely with developers MoovIT. They have created an application called Helmut (they’re a German firm, and the story behind how this app got its name is very funny) which creates the project for the editor before they begin their work. What this means in practical terms is that all the editor has to worry about is making sure their imported media goes in the correct pre-made bins, and that all of the clips go on the correct video/audio tracks of the pre-made sequences. This has a direct influence on the exported file. Working with pre-made sequences (auto generated via Helmut) eliminates a great deal of potential errors and given the scale of the event, the fast paced nature of turnover and the volume of material being published, the margin for error was immense, and the pressures even more so. When it comes to project creation for me, I use a template project that contains all of the bins & sequences I'll need pre-made. I'll open that project at the beginning of an edit, and 'save as’ with my relevant project title with a name that the 'two week me’ will remember. It just makes life that little bit easier. And who doesn't want an easy life, right?